Where talent comes to die. An East Coast, post-collegiate running club dedicated to developing talent through evidence-based training. Leaving college is tough. Leaving college running and the culture that includes is even harder. 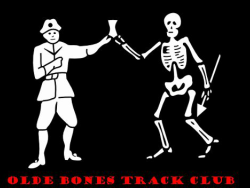 Olde Bones Track Club developed out of the need to create a training culture that allowed solid but not phenomenal college runners in New England to continue their development in the post-collegiate years. We're a collection of MD and LD girls and guys training in and around Vermont. We train together as our work schedules allow and race together at a few key races throughout the year.